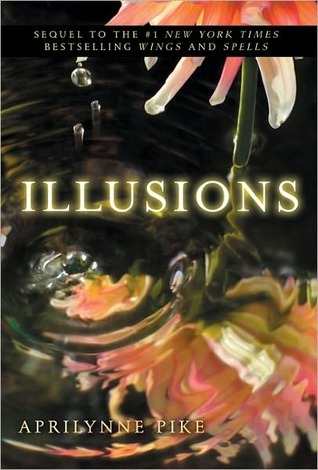 Illustions is book three in Aprilynne Pike's series about faeries. The story centers around Laurel and her journey as a faerie who lives in both "the real world" and Avalon. It is very important you read the first two books, or you will spend the entire time going"huh?" in this book. The story starts right where the last one ends. It took a few pages for me to get into the book, mainly because I had forgotten much of what had happened in book two. Most of this book centers around mysterious disturbances happening around Laurel's home. The fae are unsure if it is another organized troll system planning an attack, or an even greater foe. The book also deals strongly with the love triangle between David, Laurel, and Tamani. Laurel is nearing the end of her time in high school and is beginning to think about what that means- will she stay with David and attend college like a normal teen? Or will she return to Avalon and fully embrace the fey inside her? I will warn you that there is going to be another book. This will hopefully keep you from throwing the book in anguish after the novel is over because of the ridiculously cruel cliffhanger at the end of the book. This book had everything the first two did- a great romance (or maybe romances? ), lots of action, a good mystery, and faeries! Aprilynne Pike is an excellent author and I loved this book as much as the first two.